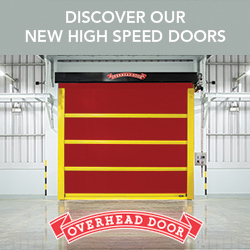 Overhead Door pioneered the upward-acting door industry, inventing the first upward-acting door in 1921 and the first electric door opener in 1926. Today, we continue to be the industry leader through the strength of our product innovation, superior craftsmanship and outstanding customer support, underscoring a legacy of quality, expertise and integrity. With three operating divisions (Access Systems Division, Horton Automatics, TODCO) and 16 manufacturing facilities across the US, UK, Latin America and Asia, we are committed to offering products and services that provide safety, security and convenience to satisfy our customer's needs. That's why design and construction professionals specify Overhead Door products more often than any other brand.